Note: More up-to-date information about our research can be found in our publications. Investigators: Anqi Xu, Gregory Dudek. We are interested in optimizing both the task performance and efficiency of interaction in a human-robot system. To achieve these objectives, we are developing a computational model that characterizes a human operator's degree of trust in an autonomous robotic system. Also, given the need to build trust within the human-robot team, we are investigating trust-initiated behavior adaptation strategies for improving the robot's task performance. Investigators: Ioannis Rekleitis, Anqi Xu, Patrick Virie. We are investigating methods for generating coverage patterns (via waypoints) of environments with obstacles. 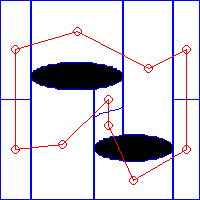 We use the Boustrophedon cellular decomposition (BCD) algorithm to break the world into cells and critical points, and then solve the Chinese Postman Problem (CPP) to generate an optimal traversal through these cells. We are deploying and validating our algorithm both using a simulated robotic platform as well as using an unmanned aerial vehicle. We are designing real-time algorithms for steering an aerial vehicle along the boundary of different homogeneous regions, using only the onboard camera for feedback. 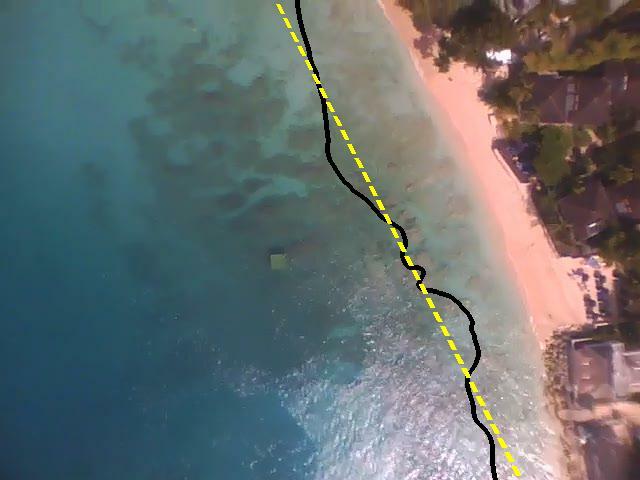 Using this technique, we have successfully flown a fixed-wing UAV over 1 km coastline trajectory. Investigators: Anqi Xu, Jimmy Li, Junaed Sattar, Gabriel Charette, Gregory Dudek. 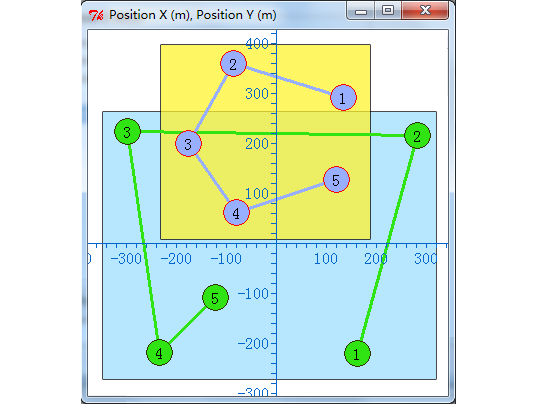 We are developing an interface for controlling mobile robots that combines aspects of graphical trajectory specification and state space programming. Our objective is to facilitate the programming and debugging of robot execution plans, containing both scheduled trajectories and activities, as well as contingency plans and failsafe behaviors. Investigators: Anqi Xu, David Cortes, Junaed Sattar, Philippe Giguere, Eric Bourque, Gregory Dudek. We are developing a visual fiducial marker system, akin to barcodes, to embed information and provide controllable positioning. 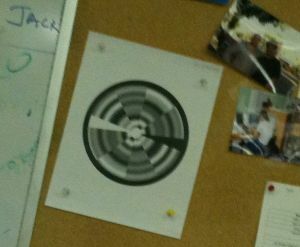 By encoding the payload data within the frequency domain of the respective visual symbol, our system is capable of extracting part of the payload even when the marker is viewed from afar or when it is out of focus. Investigators: Junaed Sattar, Gregory Dudek. We examine the construction of a vision-based interface for human-robot interaction and control for autonomous robots in arbitrary environments. The goal is to enable a human operator to control and program the robot without the need for any complicated input interface, and also enable the robot to learn about its environment and the operator. We investigate the applicability of machine learning methods - supervised learning in particular -- to train the vision system using stored training data. Combining our novel algorithms for visual tracking, visual detection of human motion, gesture recognition, visual languages and a quantitative evaluation model, we aim to create a robust HRI scheme using vision as the interaction modality. Towards implementing this framweork, a substantial amount of systems infrastructure development has also been undertaken. Investigators: Yogesh Girdhar, Gregory Dudek. We are interested in finding a small set of images that summarise a robot's visual experience along a path. We do this using a novel on-line algorithms based on a new extension to the classical secretaries problem. Investigators: Philippe Giguere, Gregory Dudek. 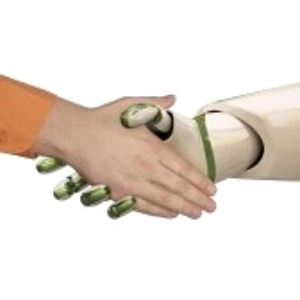 We are interested in understanding how mobile robots can learn to interpret information arising from physical contact with the world. In particular, we want mobile robots to learn to distinguish between terrain type (for a legged amphibious robot) or indoor surfaces (for a generic wheeled robot using a sensitive tactile feeler). Our method is based on a novel unsupervised learning technique that trains a classifier by exploiting the naturally occuring spatial or temporal continuities. Investigators: Dimitri Marinakis, Gregory Dudek. In this work we have examined the used of distributed sensor networks for environment inference, in particular using sparse data. 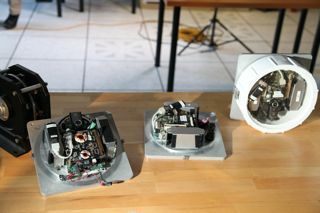 One aspect of the work has been the development of families of hardware sensor nodes either for underwater, or for terrestrial environments. Investigators: Gregory Dudek, Anqi Xu, Yogesh Girdhar, Junaed Sattar. This project deals with coordination and intereaction between different types of robot vehcile, for example between our air vehciles and our underwater systems. One of the main themes of this work is to explore methods for efficient yet highly distributed task partitioning. We are considering the problem of constructing models of human activities based on data collected from sensors found in common mobile devices, such as mobile phones and portable gaming devices. 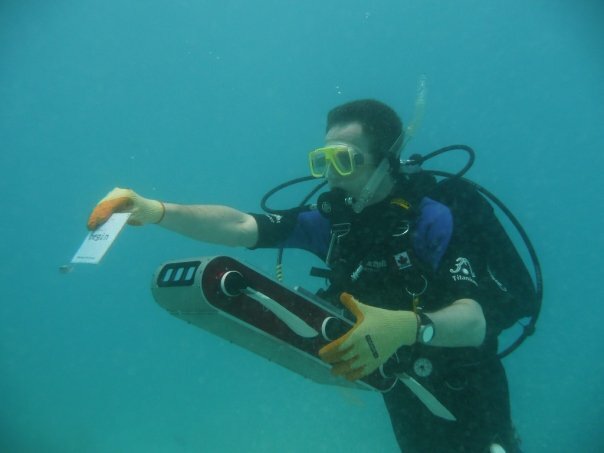 This project deals with underwater and amphibious robotics, and is the umbrella for a host of different specific research probjects at McGill, as well as in collaboration with our associates at York University. Most of the sub-projects enatil work with out Aqua family of underwater hexapod robots. This project uses extreme image compression combined with specialized image recognition methods to identify a presons location in an urban environment. Investigators: Gregory Dudek, F. Ferrie, R. Kruk, I. Christie. We are developing tools and techniques for inferring environment structure from a network of widely separated range sensors. Investigators: Matt Garden, Gregory Dudek. We are currently working on a recommendation system which allows users to specify not only which items were enjoyed, and which were not, but also to specify which features were important to the decision. We believe that having knowledge of the reasoning behind preferences will allow the system to better predict future preferences. You can try the prototype system at http://www.recommendz.com or this alternative link to the recommender system for movies. Investigators: Abril Torres-Méndez, Gregory Dudek. We are currently working on inferring complete range maps where only video images and very limited range data is available. We allow a mobile robot to rapidly collect a set of video images and very limited amount of range data from the environment and then infer the rest of the map it does not capture directly. Our goal is to facilitate the building of 3D environment models by exploiting the fact that both video imaging and limited range sensing are ubiquitous readily-available technologies while complete volume scanning is prohibitive on most mobile platforms. Investigators: Sandra Polifroni, F. Ferrie, Gregory Dudek. Sandra Polifroni is currently doing research on interest operators and human preattentive vision. Her work uses both psychophysics and computer science to qualitatively evaluate the performance of interest operators relative human vision. Investigators: Deeptiman Jugessur, Gregory Dudek. Appearance based recognition using Principal Components Analysis with the added ability to account for varying backgrounds. This is done using an attention operator to focus on the object to be recognised and performing PCA only on the sub-windows within the object. Investigators: Francois Belair, Eric Bourque, Robert Sim, Iannis Rekleitis, Gregory Dudek. Several members of the mobile robotics group are assembling components of our software infrastructure into a real-time mobile robotics testbed. Investigators:Richard Unger, Francois Belair, G. Dudek. Investigators: Robert Sim, Gregory Dudek. A Distributed, device independent mobile robot controller and simulator. It supports distributed computation and visualization and can control one or more real Nomad or RWI robots. A beta version and some additional details are available on the project page. Investigators: N. Roy (now at CMU), Iannis Rekleitis, Gregory Dudek. This project deals with the exploration of an unknown environment using two or more robots working together. 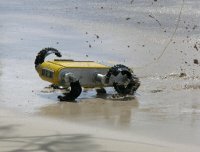 Key aspects of the problems are coordination, and particularly rendezvous, between the robots, and efficient decomposition of the exploration task. Investigators: M. Langer (NEC), M. Daum, Gregory Dudek. This project deals with the inference of environmental structure from shadow information. Investigators: F. Ferrie, Nigel Ayoung-Chee, Gregory Dudek. This project involves shape modelling based on a combination of local curvature information at multiple scale, and global superquadric surface fitting. Investigators: Iannis Rekleitis, G. Dudek. This research investigates the combined use of a sonar range finder and a laser range finder (QUADRIS or BIRIS) for exploring a structured indoor environment. The methodology is called "just-in-time" sensing. Investigators: Eric Bourque, Philippe Ciaravola,Gregory Dudek. We are examining techniques for the creation and management of virtual reality analogues for the real world. This includes the automatic acquisition of image-based VR images, as well as the automated selection of viewpoints and scenes of interest. Further information on the image acquisition system is available by following the link. Investigators: Gregory Dudek, Kathleen Romanik, Sue Whitesides. Methods for learning, encoding, detecting, and using visual landmarks for mobile robot pose estimation. Investigators: Gregory Dudek in collaboration with Professors E. Milios and M. Jenkin of York University and D. Wilkes at Ontario Hydro. We are interested in elaborating a taxonomy for systems of multiple mobile robots. The specific issues we are foc using on are the relationships between inter-robot communication, sensing, and coordination of behaviour in the context of position estimation and exploration. Autonomous navigation using sensory information often depends on a usable map of the environment. This work deals with the automatic creation of such a maps by an autonomous agent and the minimal requirements such a map must satisfy in order to be useful. One aspect of this work is the analysis of how uncertainty either in the map or in sensing devices relates to the reliability and cost of navigation and and path planning. Another aspect is the development of sensing strategies and behaviours that facilitate reliable self-location and map construction. Note: Further information about our Research can also be found on our older projects page, or in our publications.